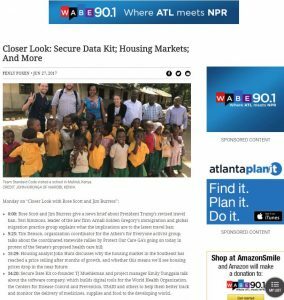 Client MarketNsight, a company focused on helping home builders and developers make smart decisions related to purchasing land and pricing product, was looking to increase exposure for its biggest biannual event, MarketWatch Atlanta, while positioning its founder and principal as an expert on housing and its impact on the economy. 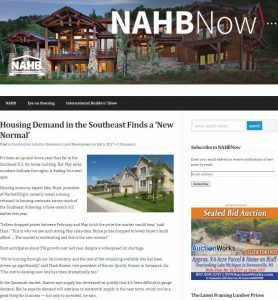 John Hunt, founder and principal of MarketNsight and ViaSearch, shared with the Denim Marketing team big news to be announced at MarketWatch Atlanta: the Southeast market has hit an absolute price ceiling on homes and, as a result, prices are moderating. In the weeks before our client’s event, our public relations team worked to create interest from the press with news releases and media advisories. We sought coverage from local press and industry publications. 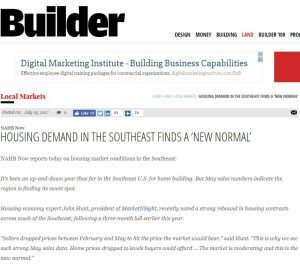 The news release heralded the major theme of the MarketWatch Atlanta event, that breaking news related to the Southeast home building market would be shared. Thanks to our team’s strong relationships with reporters and determined pitching efforts, WSB TV’s Jim Strickland interviewed Hunt for an evening news segment that aired twice on the local channel. Despite 20 years of these events under this belt, this was the first time John Hunt or MarketWatch had ever been featured on the news! See the interview here. A press release distributed though PR Newswire was picked up by 200 publications and reached a potential audience of 87,616,407. In addition to managing media relations and event coverage for MarketNsight, Denim Marketing also manages social media for the company including its Facebook and Twitter pages. Follow MarketNsight on Facebook and Twitter for the latest housing and economic news.